I recently made these two roll-and-answer dice games to practice words related to winter clothes and weather. You can find both free printable Spanish winter vocabulary games below. One of the Spanish winter vocabulary games has personal questions and pictures on the card. The other game asks questions about a picture of a winter scene, so you will need to project the picture, put it on a device or print it. Because all students play the Spanish winter vocabulary games with the same card, they hear others answer the questions. The built in repetition is intentional, and it is helpful for students learning to read in Spanish. 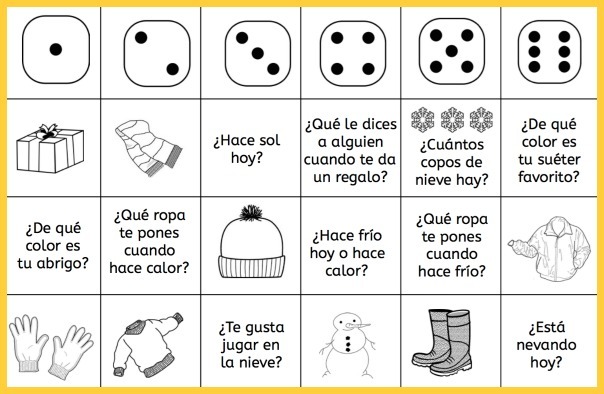 Both Spanish winter vocabulary games are played with dice. To play, students roll one die and then answer one of the questions under the number they roll. Then, they put a marker on square. For the game with pictures and personal questions, students name the picture or answer the question. For the scene-based game, students answer the question by looking at the picture. You can determine the winner in different ways. For example, the winner can be first one to answer all three questions under one number, or to complete a row horizontally, or to answer all the questions on the card. The Spanish winter vocabulary in the games are words related to winter clothes and weather. In addition, the games use question words, colors and other basic vocabulary. For example, the Spanish winter clothes vocabulary includes words such as el abrigo, las botas, el suéter, el gorro, la bufanda, los mitones, los guantes. The Spanish winter weather vocabulary includes words like la nieve, está nevando, hace frío, copo de nieve, and muñeco de nieve. Get the Spanish game with pictures and personal questions about winter. Download the Spanish vocabulary game with questions based on a winter scene. The Rockalingua song El invierno Winter is a good complementary activity for either of the Spanish winter vocabulary games. 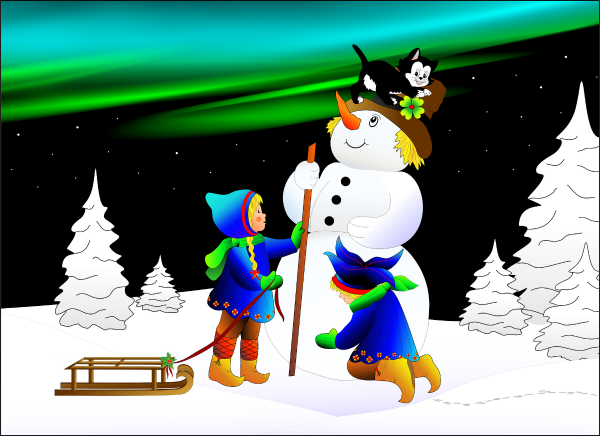 For more reading practice with Spanish winter vocabulary, check out these two snowman activities. First, in this Spanish Snowman Activity with Pictures students match descriptions to 12 picture cards of snowmen. Also, this Easy Spanish Reading: Draw-the-Details Snowman activity, students read a simple description and then draw the details on a snowman to match what they read. 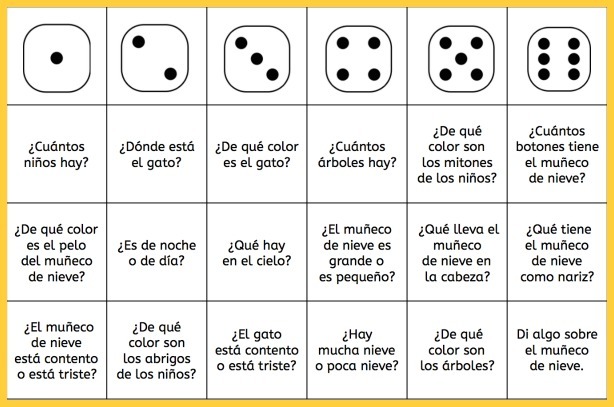 Finally, for students who are reading at a higher level, these Spanish logic puzzles with winter vocabulary are excellent reading comprehension practice. 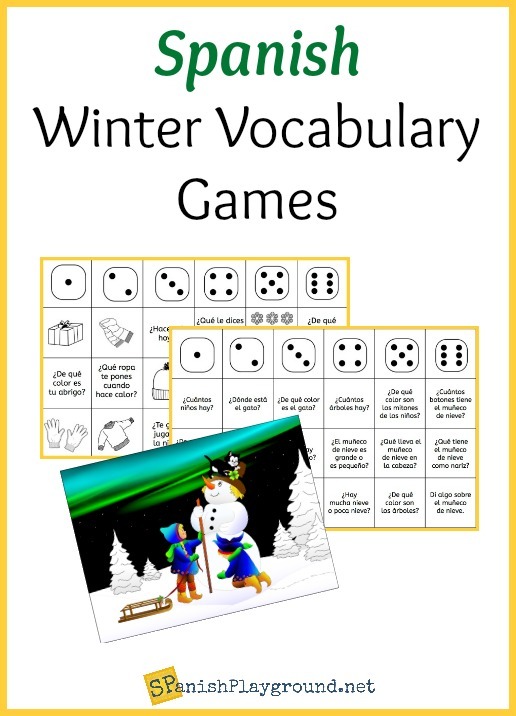 Do you have play Spanish winter vocabulary games in class? Please share your favorite ideas in the comments below.